Politics, Economy and Society South of the Sahara. The Africa Yearbook covers major domestic political developments, the foreign policy and socio-economic trends in sub-Sahara Africa – all related to developments in one calendar year. 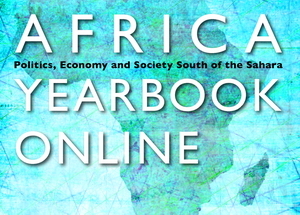 The Africa Yearbook contains articles on all sub-Saharan states, each of the four sub-regions (West, Central, Eastern, Southern Africa) focusing on major cross-border developments and sub-regional organizations as well as one article on continental developments and one on European-African relations.